I call this dish a "stew", but it's kind of like soup, too. In any case, this dish is so soothing and makes my heart warm. 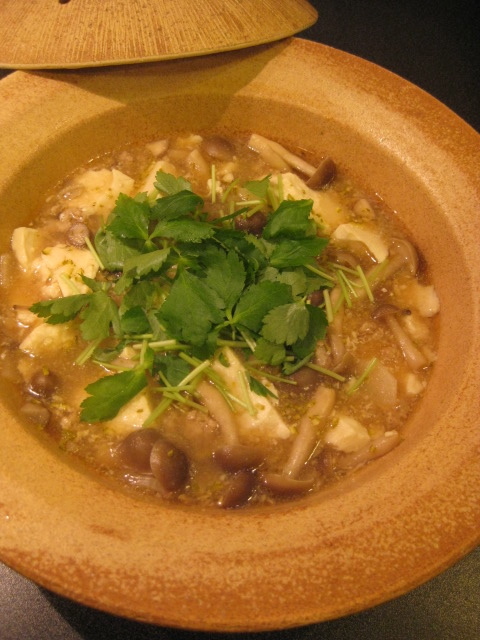 Just a few basic ingredients can make this great one-pot donabe dish. 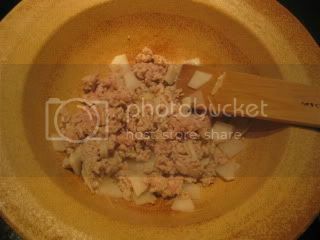 For garnish, I use finely-minced yuzu rind and chopped mitsuba (Japanese parsley) for the nice accent, but if you can't find these ingredients, you can simply omit them and the dish would still taste very nice. 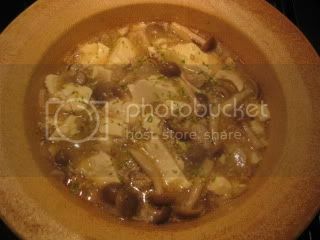 You can make this dish with any classic-style donabe. I used medium-size Yu-Kizeto. This is an extra-light weight donabe, so it's especially handy for a quick this like this. 1. 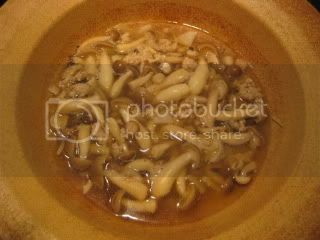 In donabe, heat the sesame oil and sauté the ginger for 1 minute over medium heat. 2. Add the chicken and daikon, and sauté until it's mostly cooked through and crumbly. 3. 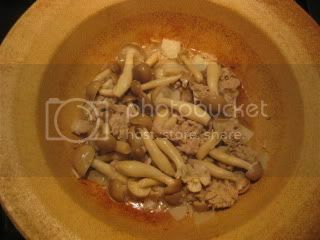 Add the shimeji mushrooms and continue to sauté for 2-3 minutes. 4. Add the sake, mirin, and dashi stock. Bring to a simmer. 5. 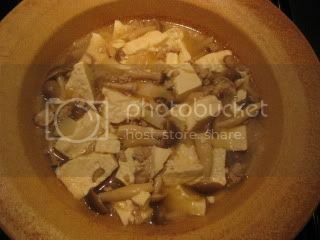 By using a spoon, break the tofu and add to the broth. Cover and simmer for a few minutes. 6. Add the soy sauce and stir. Adjust the seasoning by adding salt, if necessary. In a small cup, whisk together the potato starch and water. Drizzle the mixture into the broth and stir to thicken. 7. Remove from the heat and sprinkle a pinch of sansho pepper. Garnish with the yuzu rind and mitsuba. Each ingredient gives a nice flavor profile, yet they are nicely integrated on the palate. Very lovely.